Ride head and shoulders above the rest! The Coker Big One unicycle is equipped with a 36 x 2 1/4" pneumatic tire from the Coker Tire Company. It is quite possibly the largest pneumatic tire ever produced for a unicycle. 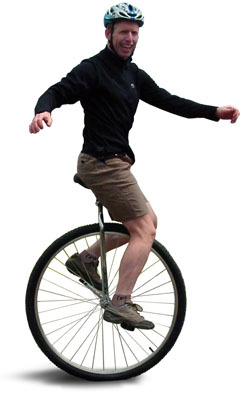 The large wheel on the Coker unicycle makes it ideal for long distance unicycling. Because of the high saddle and crank position, it is not considered a good choice for learning. However, all that angular momentum makes for a smooth and steady ride once you've mastered the basics. The average North American works 27 hours a month paying for the 32 hours per month they spend driving!